I’ve taken on the challenge to delve into lesser-known cuts of beef. Most people are familiar with cuts like filet mignon, t-bone and sirloin… but there are many other lesser-known cuts. Many of these are relatively inexpensive, and with the right preparation, can be just as delicious and tender as more expensive cuts. This week I tried grilled flank steak, a cut of meat from the abdominal muscles of the cow. It’s a tougher cut, so this preparation starts with a marinade, then quickly grilled, and sliced across the grain. This recipe comes together very quickly. For the marinade, throw the ingredients in a food processor, pulse, then transfer to a container with the meat and store overnight. Grilling only takes a couple minutes per side. Cook up an extra flank steak, as the leftovers can be used in other preparations. 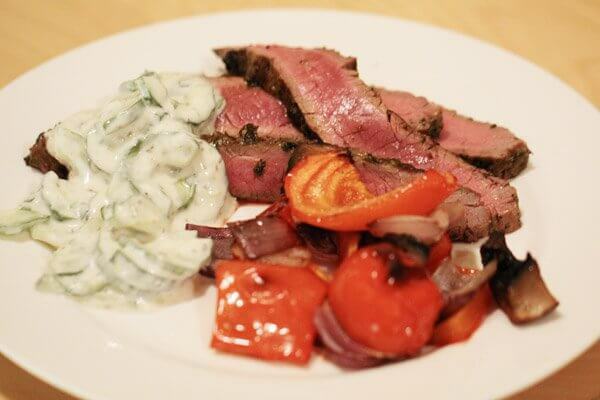 The dinner flank steak was served with roasted red peppers and onions, and served alongside a cucumber-yogurt sauce. Leftovers were used for an open-faced sandwich with goat cheese.